Celebrating the life of Elwood C. Massey, Sr.
Be the first to share your favorite memory, photo or story of Elwood. This memorial page is dedicated for family, friends and future generations to celebrate the life of their loved one. 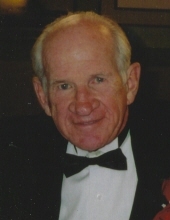 Obituary for Elwood C. Massey, Sr.
DURHAM: Mr. Elwood C. Massey, Sr. passed away on Monday, April 1, 2019. He was the son of the late Harold A. Massey and Vallie Cook Massey. He was retired from American Airlines. Mr. Massey is survived by his wife, Joanne Maynor Massey; daughters, Patti Massey Bostian and husband Mike, and Amy Massey Dunbar and husband Dan; sons, Elwood C. Massey, Jr. and wife Shirley, and Howard Duane Massey and wife Karen; brother, Dennis Massey and wife Donna; sister Joyce Ellis, grandchildren, Kevin, Chris, Amanda, Philip, Elizabeth, Corey, Jonathan, Laura, Allison, Angela; great-grandchildren, Ayla, Zoe, Piper, Cora, Everett, Levon, Clayton, Rowan; and several nieces and nephews. The family will receive friends from 6 to 8 p.m. on Friday at Clements Funeral Home in Durham. A funeral service will be conducted 2 p.m. on Saturday at Berea Baptist Church, Durham. Burial will be in the Berea Baptist Church Cemetery. Flowers are acceptable, memorial contributions may be made to SECU Jim & Betsy Bryan Hospice Home of UNC Health Care, 100 Roundtree Way, Pittsboro, NC 27312. To send flowers or a remembrance gift to the family of Elwood C. Massey, Sr., please visit our Tribute Store. "Email Address" would like to share the life celebration of Elwood C. Massey, Sr.. Click on the "link" to go to share a favorite memory or leave a condolence message for the family.